Special occasions deserve that very special touch. Big celebration coming up? Whatever your celebration, big or small, we've lots of ways to help you make it wonderful. The Arlington Restaurant is as impressive a setting as you could find anywhere to celebrate a special occasion, flowers, balloons and cakes can be arranged for you. For smaller events, you can opt for one of our private dining room, the Grenville with its own distinctive character it makes a very special intimate venue. 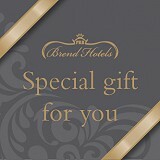 Indulge in luxury accommodation that has been designed to reflect the comfort and style that is characteristic of the Brend name, luxury extras can be arranged such as bathrobes and slippers, a Champagne Breakfast, freshly cut flowers or chocolates in the room. Give us a call on 01271 345861 or fill in the enquiry form and let us know what you are celebrating and let us come up with the extra special touches.